Do you find that your child is forgetful? Are they unorganized? 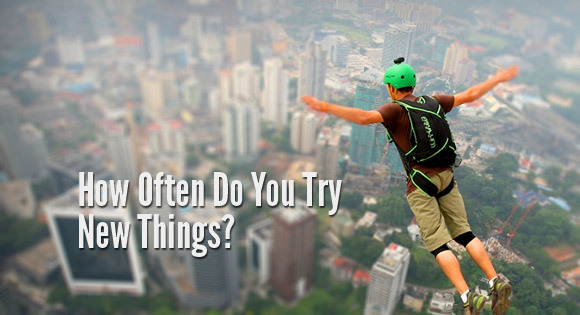 Not open to trying new things? These are all examples of bad habits that you definitely don’t want your child to develop. You may not realize it, but these habits shape how your child functions both socially and academically. That’s why it’s important that your child develops good habits early on. Don’t worry if your child has already developed a few bad habits of their own. Bad habits are definitely breakable! Fortunately your child has loads of time to develop good habits before college. Here are 6 good habits to build for college. The brain can only handle so much at once, and when you’re overloaded with things to remember, life can get pretty stressful. Stress leads to withdrawal, withdrawal leads to missing/late/poor assignments, and before you know it your grades are slipping! Here are a few helpful tips that are sure to make your child a better planner! Buy your child an academic planner, sit down with them and help them write down all of their important due dates for assignments, papers, tests and quizzes. If you don’t want to go out and buy an academic calendar for your child, they can just use the calendar in their mobile phone, or one of the many great online calendar apps–we recommend Google Calendar. 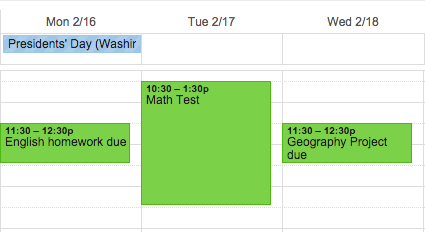 Planning is easy with Google Calendar! Get your child used to making lists. At the beginning of each day, have them write out everything they need to accomplish that day, whether it be studying for a quiz or finishing their math homework. Your child will soon learn that lists are academic life preservers! Does your child have a quiz tomorrow? Then they probably don’t need to be working on that project that isn’t due for another week. Teach your child about prioritization! Assignments due in one or two days should always be their top priorities. Once they finish these assignments, then they can start working on that project that’s due later. Studying for huge exams and writing big 12-page research papers can be scary and difficult to plan for, but when you break these big tasks into smaller tasks I promise they’ll seem much less daunting. College is all about new opportunities! A smart student can cruise through classes and earn A’s, but are they really getting the most out of it? Here are a few tips that are bound to help teach your child to challenge themself. Even if your child doesn’t need organic chemistry or physics to graduate, it never hurts to branch out! These sorts of challenging classes will expose your child to new fields of study and teach them about hard work and discipline. Teachers LOVE feedback. If your child wants something more out of a class, they should tell them. If they don’t understand something, they should ask them. They’re there for THEM. Seems like a no-brainer, but again, really bright kids are oftentimes glued to their phones or talking during class. After all, they can just do the reading later, right? Yes, technically, but the benefits of in-class discussion cannot be replaced. I’m sure your child will find that the more they participate in in-class discussion, the more they get out of their classes. Encourage your child to branch out and try EVERYTHING. Has your child ever been on a sports team? Have they ever played an instrument? Well, there’s a first time for everything! The more they explore their interests, the more likely they are to find something they’re really interested in–this can be super helpful when deciding a college major. It’s like they always say! You are the average of the five people you spend the most time with. Want your child to be bright, hardworking and polite? Encourage them to hang out with other hardworking, intelligent classmates! Obviously you can’t pick their friends for them, but they can tell whether or not you like their friends. Maintaining good health is of the upmost importance at all stages of your child’s life. Is your child exhausted all the time? Maybe they need an earlier bedtime. Are they hungry all the time? Maybe they’re not getting enough food, OR the right food. Are they stressed or cranky? Maybe their workload is too hefty. Regardless of what’s wrong with your child, you will notice the signs. It’s important that both you and your child recognize these signs and take action to improve their lifestyle. Everyone learns a bit differently. 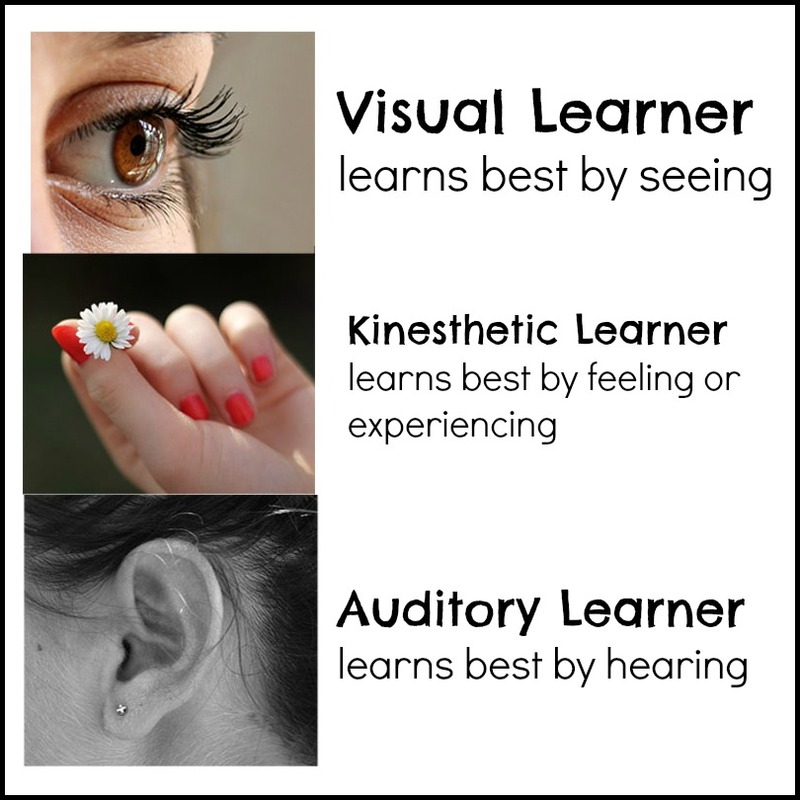 Some people are visual learners, while others are auditory learners. It’s important that your child recognizes what type of learner they are. This sort of knowledge can be beneficial to them in class AND when they’re studying at home. There you go! If your child develops these habits, they’re bound to be successful in college. 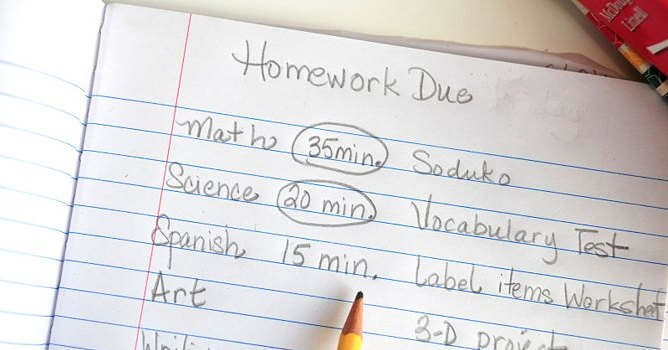 Even if your child forgets to turn things in every now and then, don’t freak out! I’m sure they’ll do just fine in college. Got any other helpful habits for college? Share with us in the comments below!